The sport Kevin Barry loves so passionately has taken a toll on his body. At only 22 years old, the linebacker has already had two surgeries from his time on the gridiron. Yet you wouldn't know it from his performance – he's still at the top of his game. 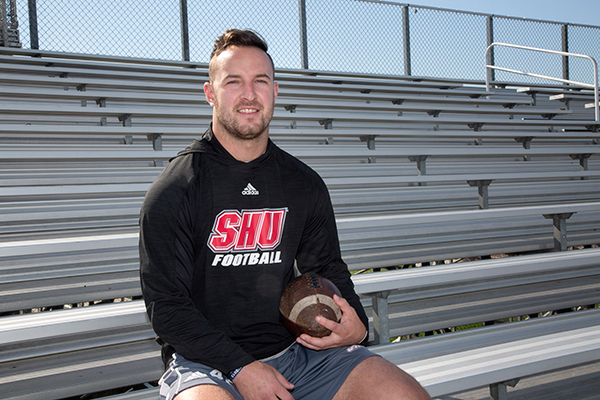 Kevin was only 17 when he was on the football field and planted his right knee in such a way that he tore his anterior cruciate ligament (ACL). No amount of physical therapy would repair it – he needed surgery. He went to see Dr. Raphael Longobardi, a board–certified orthopedic surgeon specializing in sports medicine and athletic injuries who is Chief of Orthopedic Surgery at Holy Name Medical Center. His areas of expertise include knees, shoulders and elbows. "Dr. Longobardi prepared me for the surgery by telling me what to expect," Kevin said. "He made sure I understood what he was going to do and how I would feel and everything he said was exactly right." Then in October 2016, another player tried to jump over Kevin during a game but landed on him instead. Kevin tore his labrum – the cartilage that attaches to the edge of the shoulder socket to keep the joint in place – and once again needed surgery. He went straight to Dr. Longobardi. "Both surgeries were same–day procedures and they were phenomenal," Kevin said. "And everything at Holy Name was great – the people made me so comfortable and I knew exactly what to expect. I feel really good now and will keep playing as long as I can."